I ran tugs in the northeast for almost 20 years before I got the bright idea to go out on my own and start a tug company. Previously, I had worked around surveyors, performed a few rudimentary surveys on tugs and barges and then had to hire a surveyor when I found a tug I liked in New England. I quickly learned that words can kill your dream and a boat. I hired a competent surveyor from a respected firm. I had been through the tug, had an engineer help me with the mechanical parts and then brought the surveyor in. One sentence killed the deal: engine wouldn’t start. It wouldn’t start because the owner wasn’t there to start it and it wasn’t mine to start. The underwriters demanded a mechanical survey which was a lot more than I wanted to pay so I moved on to another tug. The survey lived on and the boat couldn’t be sold without the mechanical survey. Eventually, she was scrapped. The surveyor did his best to rectify the situation as did his firm, but the horse was out of the barn. That lesson stayed with me. As I started performing more surveys, grammatical correctness became as important as survey accuracy. The next boat I looked at was in Florida. A surveyor was recommended. He wrote a very detailed survey with 44 recommendations. Many of the details and most of the recommendations were irrelevant. They weren’t terribly important for a tug – hot water heater has rust, bad housekeeping, rust on the bulwarks – or to me. The underwriters wanted all 44 taken care of before they would insure it. The surveyor was a yacht surveyor and probably a very good one, but he had no business surveying a tug. Spars and rigging shouldn’t be part of the towing vessel survey. Eventually, I found a boat and a tug surveyor and I went to work towing. Having worked on tugs, managed them, repaired them and finally owned one, I know what I want in a survey: descriptive, honest information that deals with the safety and reliability of the vessel. I want to know that she has good bones (or bad), that the equipment for towing and lifesaving are appropriate for the vessel and in good condition (more on definitions later) and that it will meet the regulatory requirements. Subchapter M will change surveying. It mandates what will be in a survey of your towing vessel. Parts 137, 140, 141, 142, 143 and 144 of 46 CFR Subchapter M tell you everything that the U.S. Coast Guard wants in a survey. Combine that with everything that you want and you’ll have a great, useful look at your vessel. A robust audit and survey program will help you improve in ways that you never thought of before. 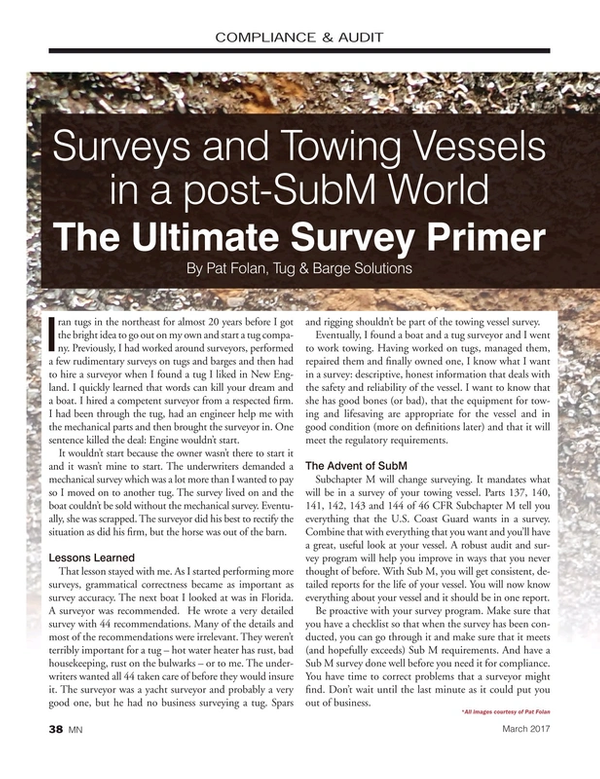 With Sub M, you will get consistent, detailed reports for the life of your vessel. You will now know everything about your vessel and it should be in one report. Be proactive with your survey program. Make sure that you have a checklist so that when the survey has been conducted, you can go through it and make sure that it meets (and hopefully exceeds) Sub M requirements. And have a Sub M survey done well before you need it for compliance. You have time to correct problems that a surveyor might find. Don’t wait until the last minute as it could put you out of business. Plating: What condition is your bottom plating in? How about the side shell? Bow plating or rake sheet? Stern horizontal plates? Tunnels? Is there excessive corrosion, chafing, buckling or other deterioration? Gauging: Have you done a gauging of the hull? Pay attention to suspect areas. What’s the steel like under your generators? How are the stern tubes? Are there fractures? Have fractures been repaired in the past? Doublers: Are there any doublers on your hull? If so, where are they? Were you patching a hole, covering bad steel or putting them on as wear plates? What does the steel look like on the inside? Set-Ins: Are there any sharp set-ins (where the plate forms an angle of less than 135o (2.5” depth/1’span) in any direction or where internal attached framing is abruptly tripped? Are there any smooth set-ins (where the plate is set-in 1” deep/1’ span, <4” max depth) where the internal framing is intact and connected? Do any of the set-ins exceed 25 percent of the beam in a transversely-framed bottom? Structural Members: Is there any bending, twisting, buckling, crushing or other distortion of shaped or flanged structural members (angles, channels, I-beams, etc.)? Is any distortion of structural members associated with wastage? Coatings: What is the overall condition of the exterior coatings? When was the vessel last bottom painted? What type of paint was used? Was the bottom paint approved for use in the US? Anodes: Do you have any? Are the ones there still effective? How long were the current ones there and will they be effective until you haul out again? Propellers, Struts and Bearings: How many propellers are there? What are the propellers made of? How many blades? What size? How is the propeller fitted to the shaft and what keeps it there? Are there stress fractures in the hub or on the blades? Are the blades damaged? How long have they been in service? Are the tail shafts and bearings in satisfactory condition? What do the struts look like? How about the welds? Is there any damage that would weaken them? Rudders: How many rudders are there? What shape are they in? What is the condition of the tubes, shafts and bearings? Are the rudder bearing clearances within allowable clearances? What shape is the flange in? Is there excessive wear? Is the shaft bent or deformed? Through Hull Fittings and Valves: How many through hull fittings are on the vessel? Where are they? What shape are they in? Is there corrosion or deterioration around and within the fitting? Were the valves examined and tested? Were the bodies, guides, threads, seat stems, discs and bolts in satisfactory condition? Internal Structural Examination: Have you examined all the welds? Were there any problems? Is there any distortion of the framing or bulkheads? Are there signs of electrolysis? Did you gauge the structural members for material thickness? Coolers: Are there coolers on the bottom or sides? What type are they? What condition are they in? Are there anodes on them? Are there signs of corrosion or deterioration? Wastage: How much wastage is too much? Steel should be replaced when wastage exceeds 20 percent from the as required thickness for structural members and 25 percent for plating. These percentages stick with class rules and NVIC 7-68. That’s a lot of questions. But that’s the point. Begin looking at your vessels and/or fleet in ways that you never have before. And make sure that your marine surveyor does this as well. The game didn’t just change for you; but for the surveyors as well. Pay attention to details. Some insurance companies have begun to ask that surveyors to look at risk factors beyond the vessel. Today, in addition to detailing the structure and equipment on a boat, I am looking at your Safety Management System, Maintenance Program, Crew Competency and Vessel Operations. This will grow as Sub M requires the surveyors to perform some audit functions and your auditors are looking at your vessel and your crew. As surveyors, we will want to know that your crew is competent, knowledgeable and reliable. Are they training? Are they conversant in your TSMS? Are they keeping detailed records on vessel activities and personnel? Are they drilling? A surveyor should observe them drilling and needs to see that they are competent. What is “good?” What language does your surveyor use to describe the vessel and crew? It needs to be defined. Every survey I perform contains the definitions in the beginning so that when I say that something is good or the company is fair, you will know what I mean. And there will be no gray area. Travelers Insurance, for example, has a great set of definitions for the surveyor to rate both the operation and the equipment. These take the subjectivity out of the survey. Many established businesses have used the same surveyors for years. They have a good relationship with the surveyor and get a good report from him. If your surveyor is part of a company that has more than one surveyor, ask for someone else the next time. New eyes on your vessel will help. One of my employees has extensive U.S. Coast Guard experience and that’s something that I lack. When we look at a boat, we see different things. My industry experience guides my surveys and audits. His inspection experience guides his. We both learn from each other and in turn, offer the customer a better product. Make sure that your surveyor is as objective as humanly possible. You want an honest, critical report. You want to avoid injury, death and harm to the environment and a survey that glosses over or ignores the problems will come back to bite you. You may not initially like what you read, but your company and vessel will improve. Vet your surveyor. If he or she is in SAMS or NAMS, find out what his or her specialty is. Ask for a sample survey or two. Read them over. Look at the pictures. Do the reports tell a story? If you were to turn one of them in to your underwriter, would they get a good feel for the boat? Would they know what was being written about? Are the photos composed so that they tell the story? Could you look at the pictures and know the boat? Could you see details? Finally, do the reports pass the Sub M test? Do you know what Sub M is looking for? If not, then you won’t be able to adequately judge the surveyor. And that could be costly. You want the best information possible so that you can perform the needed maintenance to maintain regulatory compliance and you also need it to be compliant. If the surveyor isn’t capturing all the necessary information, it will eventually be detrimental to your COI application. As an industry, we have largely left the surveying up to the surveyors, but it’s time to take a more active role in the process. Learn more about their trade and Subchapter M and you’ll learn more about your equipment.